We analyze the impact of trap states in the oxide layer of a superconducting tunnel junctions, on the fluctuation of the Josephson critical current, thus on coherence in superconducting qubits. Two mechanisms are usually considered: the current blockage due to repulsion at the occupied trap states, and the noise from electrons hopping across a trap. We extend previous studies of noninteracting traps to the case where the traps have on-site electron repulsion inside one ballistic channel. The repulsion not only allows the appropriate temperature dependence of 1/f noise, but also is a control to the coupling between the computational qubit and the spurious two-level systems inside the oxide dielectric. We use second order perturbation theory which allows to obtain analytical formulae for the interacting bound states and spectral weights, limited to small and intermediate repulsions. Remarkably, it still reproduces the main features of the model as identified from the Numerical Renormalization Group. We present analytical formulations for the subgap bound state energies, the singlet-doublet phase boundary, and the spectral weights. 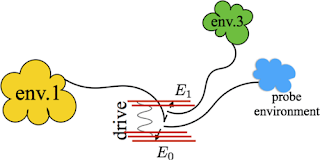 We show that interactions can reverse the supercurrent across the trap. We finally work out the spectrum of junction resonators for qubits in the presence of on-site repulsive electrons and analyze its dependence on microscopic parameters that may be controlled by fabrication.